One of the biggest highlights in Reguliersdwarsstraat are the street parties to celebrate the annual Amsterdam Gay Pride. 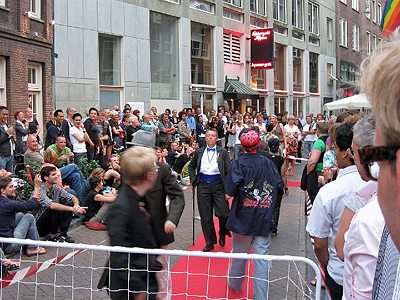 This event was first held in 1996 and it was initiated by people from gay dancing Havana in Reguliersdwarsstraat. Despite its name, this Pride has a different origin than many other Gay Prides around the world. Those usually mark the Stonewall riots, but in the Netherlands, that tradition is being continued by another event, called Pink Saturday. 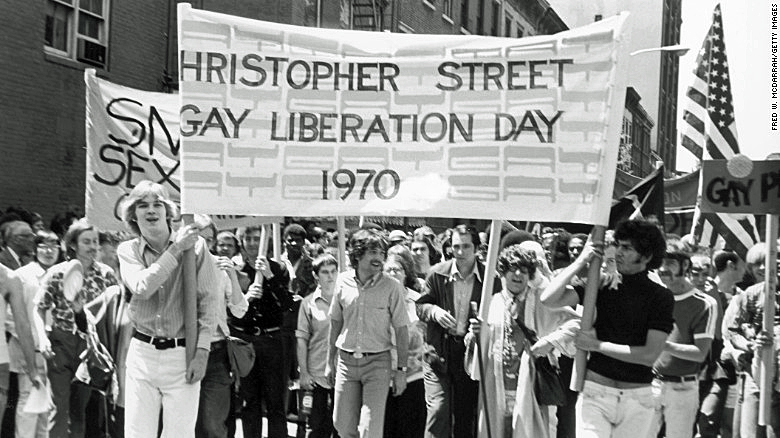 The Stonewall riots took place on June 28, 1969, when gay people, but especially transvestites, fiercely fought back following a police raid on the Stonewall Inn, a gay bar in New York City. On June 28, 1970, the first anniversary of these riots was commemorated in New York and a few other cities with the first Gay Pride marches, which were followed by "gay liberation and freedom" demonstrations in more and more cities all over the US in the next years. In the Netherlands, there had already been two small gay demonstrations in 1969 and 1970, but the Dutch gay rights organisation COC initially didn't want to organize a Gay Pride march like in the US. COC saw gay people as ordinary human beings, so in their opinion there was no need for a demonstration. 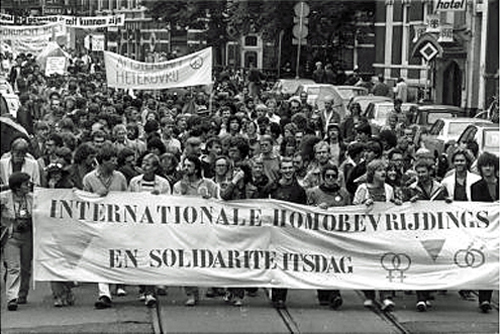 Only after the organisation changed its policy, the first Dutch "Gay Liberation and Solidarity Day" or "Gay Pride Day" could be held: in Amsterdam on June 25, 1977.
and Solidarity Day, also known as Pink Saturday. In 1979 this event, held on the last Saturday of June, was renamed into Pink Saturday (Dutch: Roze Zaterdag), and since 1981 it is held in a different city each year. This makes this Dutch Gay Pride atypical compared to most other Prides elsewhere in the world. Pink Saturday was back in Amsterdam again in 1994, when it also was EuroPride. There was a traditional march through the streets, but on some of the bandwagons there were explicit sexual acts, which shocked some of the 67.000 visitors. Because at the same time the attractiveness of Amsterdam's gay scene was declining, a group of people from the popular and trendy gay dancing Havana in Reguliersdwarsstraat came up with a new event: Amsterdam Pride. It was estimated that early August has the least chance of rain, so the first edition was held in the first weekend of August 1996. The new Amsterdam Pride was different from Pink Saturday and most other Gay Prides, as it was solely meant to be a celebration of freedom and diversity in Amsterdam, and not as a political demonstration for equal rights or against discrimination. Since then, there are actually two Gay Prides in the Netherlands: the older one, which is held in June in a different city every year and is called Pink Saturday; and the newer one, which is held in August in Amsterdam. Although the Amsterdam Pride wasn't in the tradition of the Stonewall riots, the fact that it is held in the capital city and is called "Amsterdam Pride" made that for most people this event became the main Dutch Gay Pride, like those in other capitals all over the world. With its more regional focus and less issues to fight for, the original Pink Saturday wasn't able to attract as much attention and the number of its visitors ultimately stuck around 40.000. The Amsterdam Pride was unique, because instead of a march with trailers through the streets, there's a parade of boats over some of the city's world famous canals. Right since the beginning in 1996, there were also boats participating that were manned and decorated by the big gay venues from Reguliersdwarsstraat. The Canal Parade was so successful, that later on the concept was copied in a few other Dutch cities: since 2010 there's a small floating Gay Pride parade in Alkmaar as well as in Utrecht since 2017. A similar parade over the local canals was held during the Pink Saturday of 2017 in Den Bosch and during PRIDE Leeuwarden in May 2018. In 1998, the Canal Parade marked the start of the fifth edition of the Gay Games, which were held in Amsterdam that year. With over 14.000 mainly gay athletes and some 250.000 visitors from all over the world, this was the by then biggest gay event held in the Netherlands. In the week of the Gay Games there was also a gay & lesbian open air cinema at Nieuwmarkt and a range of LGBT exhibitions and presentations. Together with smaller gay sports events, these cultural activities also became part of the annual program of the Amsterdam Pride. As the highlight of the Pride, the Canal Parade was so successful, that already since 1998, the number of boats had to be maximized at 80. The number of visitors rocketed from 20.000 in 1996 to 250.000 in the early years of the new millennium, making it one of Amsterdam's largest public events. Since 1996, the Amsterdam Pride had been organised by Gay Business Amsterdam (GBA), an association of gay businesses, led by Siep de Haan. He was one of the inventors of the Pride, but also became notorious for criticizing the local government. Maybe also because of that, the city granted the permission for organising the Pride to a new foundation called ProGay in 2006. ProGay was led by Frank van Dalen, who was also chairman of gay rights organisation COC. He had a more commercial approach and at the same time gave the event a political dimension, the latter making it resemble the Pink Saturday. In 2008 it was the first time the mayor of Amsterdam and three cabinet ministers attended the Canal Parade. In 2009, the Gay Pride was also LesBian Pride. In Reguliersdwarsstraat, coffeeshop Betty, TOO! organized the first open air Drag King contest, in which women dressed up as men. This successful event had a second edition in 2010, but afterwards the organisation was not able to continue it. 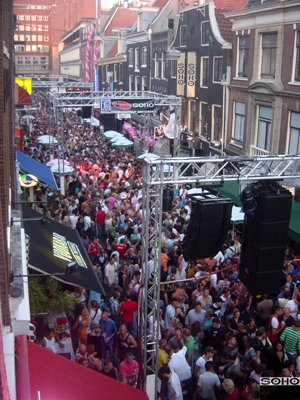 The main street party in the western part of Reguliersdwarsstraat had grown into a real open air disco, attracting thousands of gay and gay minded people. In the eastern part of the street, the Reality Bar organised its own street party with a Caribbean atmosphere and artists from the former Dutch colonies. 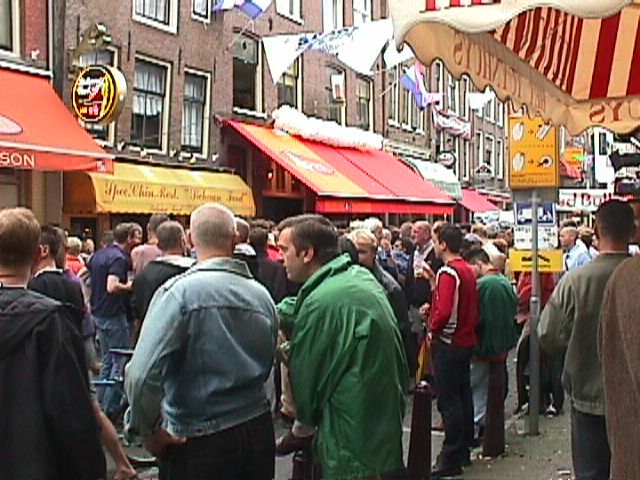 Initially, the main Gay Pride street party in Reguliersdwarsstraat was organised by Havana and April, from 2002-2006 by the then new Bar ARC, and from 2007 by the company of bar-tycoon Sjoerd Kooistra, who owned most of the big gay venues in this part of the street. As such, he also spent a lot of money for big boats to participate in the Canal Parade. 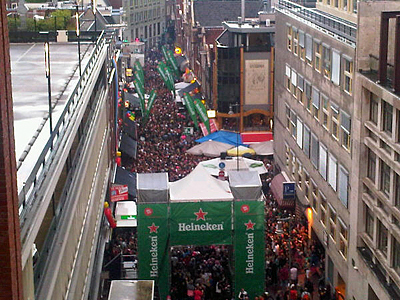 After 2010, the street party in the western part of Reguliersdwarsstraat was organized by a combination of varying gay and straight bar owners, but they had to cope with increasing costs arising from stricter safety regulations. One of the results is that, since 2011, the Gay Pride street party has to be closed off by fences, when a maximum of 4500 visitors are in. The growth of street parties and outside taps in the rest of the city center was also capped. Not much later, the city government stepped down from the ambition to be a leading Gay Capital in favor of being an attractive Gay Destination. Since 2012, there is also a Pride Walk to demonstrate against anti-gay violence, foreign and domestic. With this march, from Mercatorplein to the Homomonument on Westermarkt, yet another element from the traditional format of the Pink Saturday and the "Stonewall Gay Prides" was added to the Amsterdam Gay Pride. As of 2014, the Amsterdam Gay Pride again got a new organiser, this time the Amsterdam Gay Pride (AGP) foundation. They won the license for organising the event for at least the next three years, and decided to name it back into "Amsterdam Pride" after a reconciliation with the initial organiser GBA. In 2016, Pink Saturday was back in Amsterdam, so for the first time since the Amsterdam Pride was established in 1996, both Gay Prides were held in the same city. Just like in 1994, Amsterdam also got the honour to celebrate this as EuroPride. This triple gay event encompassed two weeks of events, parties and other activities. For the first time there were also big parties on the central Dam square and the Austrian winner of the Eurovision Song Contest, the popular drag queen Conchita Wurst, acted as international ambassador.